Failed suicide bomber says he wanted to blow up Manhattan subway at rush hour because of Israeli response to Gaza rockets. 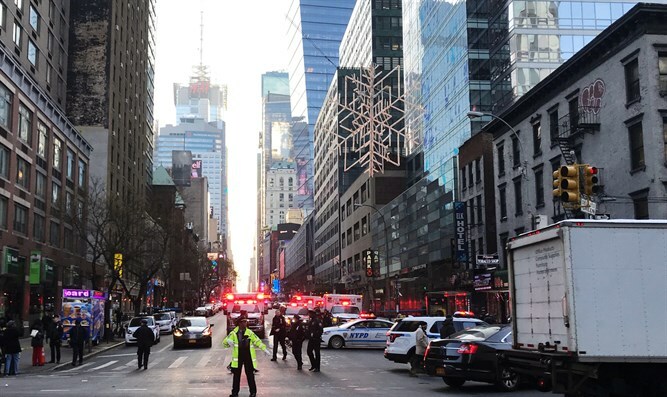 Akayed Ullah, the suspect in today's attempted bombing attack in Manhattan, told investigators that he carried out the attack as an act of "revenge" for recent Israeli actions in the Gaza Strip, law enforcement officials told CNN. Ullah, a Bangladeshi national, attempted to carry out a suicide bombing attack on the Manhattan subway line during rush hour Monday morning. His homemade explosive device partially detonated prematurely, injuring four people, including Ullah. NYPD sources initially stated that Ullah was inspired by the ISIS terrorist organization. However, no direct link with the terror group has been found. CNN reported that Ullah may have sought revenge for Israel's bombing of Hamas targets in the Gaza Strip Friday. The IAF strikes came in retaliation to the firing of two rockets at Israel from Gaza. One of the rockets struck a kindergarten. The New York Post reported that Ullah told authorities that he sought revenge because "they’ve been bombing in my country and I wanted to do damage here."